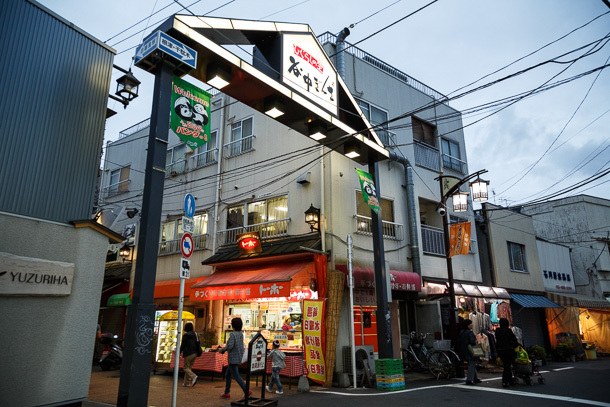 Yanaka Ginza Shōtengai (谷中銀座商店街) attempts a balancing act. 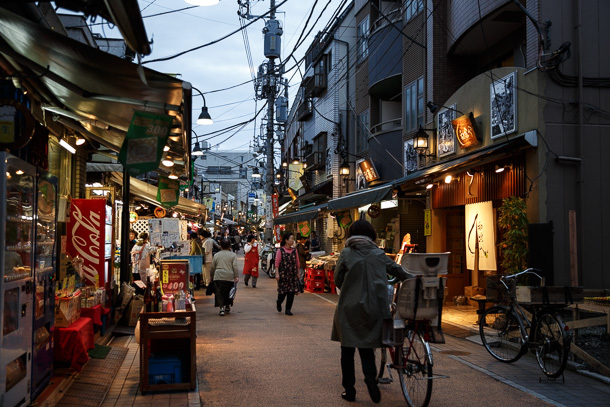 The 170 meter shopping street in Yanaka, to the north of Ueno Park and a few minutes west of Nippori Station, honors its roots as a local neighborhood market place and public space, while capitalizing on its popularity among domestic and foreign tourists as a place to experience Tokyo as it looked around the mid 20th century. Indeed, its official website calls out the fact that practical necessities and fresh food have been reduced somewhat, replaced with sellers of sweets and souvenirs catering to leisure visitors, and goes so far as to apologize to locals for the surge in foot traffic from outside the neighborhood on weekends. 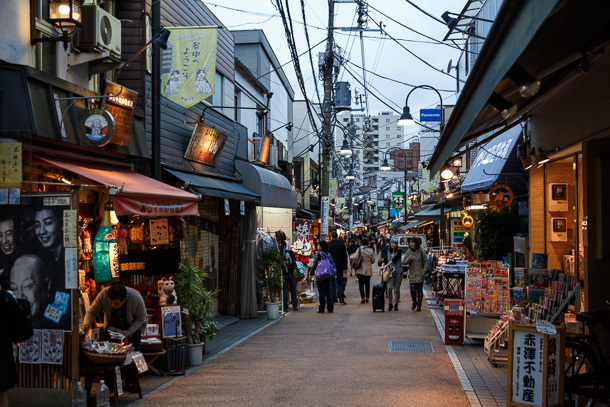 That said, the street is still comprised almost entirely of independent, local business owners, a big part of what creates the comfortable and colorful environment for which it has become known. 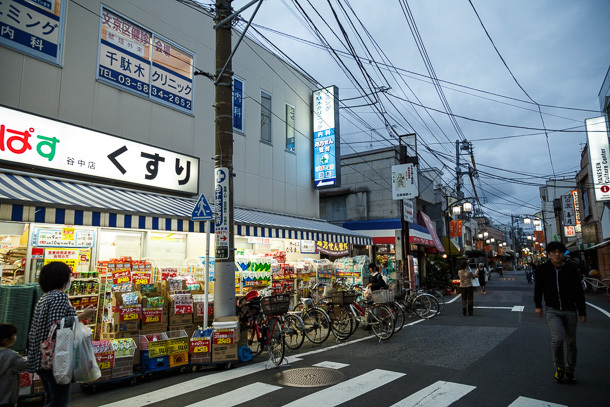 It also has a proactive business cooperative that has been invested in seeing the street respond to crises, particularly the waves of supermarket and convenience store expansion, and evolve to thrive with the times, while holding on to as much of its heritage as it can. 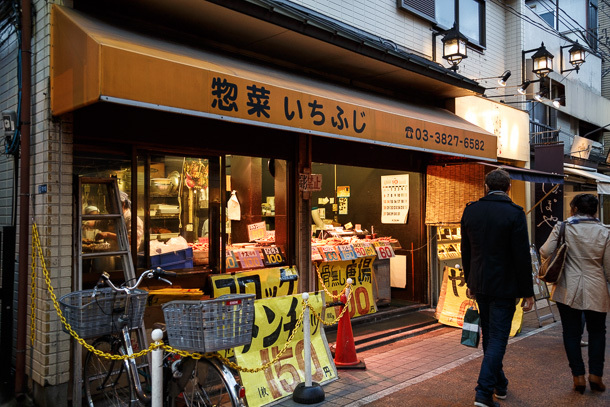 Rather than cast catering to tourists as selling out, here I think it reflects shrewd awareness of the Yanaka Ginza’s strengths and the reality that shōtengai are endangered species that must think carefully about their business strategy if they are to survive. For those that have the assets, a mix of historic preservation with continuing commerce may be the right path. 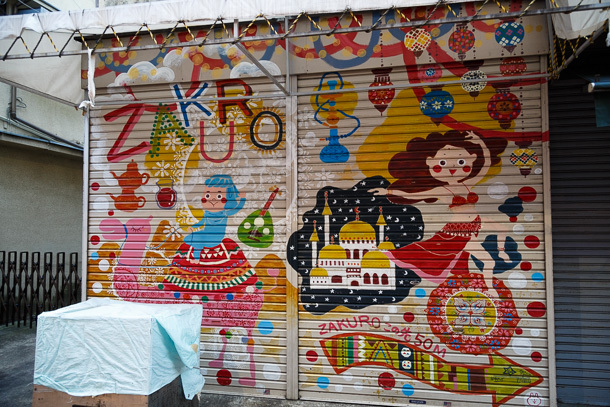 A few minutes walk from Nippori Station brings you to this crest. Looking down at the neighborhood and shōtengai reminds you that, contrary to popular belief, Tokyo does have topography. The stairs are nicknamed yūyake dandan (夕焼けだんだん)—lit. sunset gradually—for the spectacular evening views from this vantage point. Though this was taken at golden hour, the overcast sky gave me a blue-green tone instead, which turned out to be a great compliment to the warm shop lights, even if it wasn’t what I was expecting. The visual is apparently a popular background choice of cinematographers. 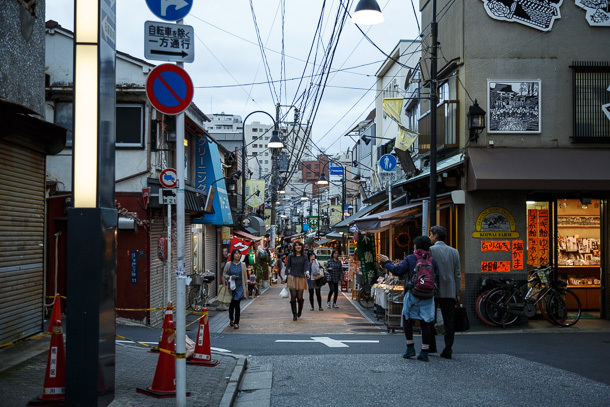 Even Tokyoites who have never been to this part of the city are likely to recognize the scene, which is often used in TV dramas. Something noticeable as soon as you approach the entrance is the clear sense of place. 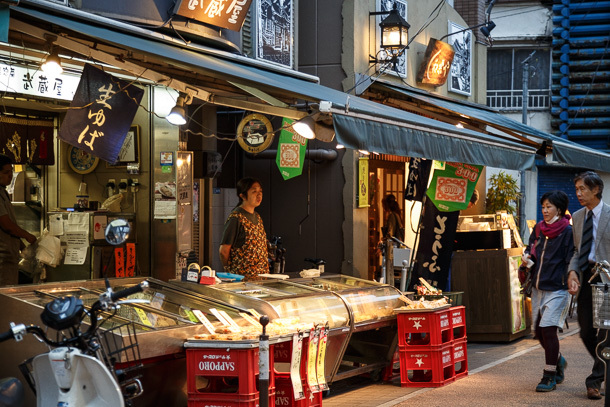 Though each shop is a little different and some predate the 70 year old business cooperative, unified green awnings and streetlamps, shop signs, street furniture and even the paving material of the street all combine to create a specific environment. 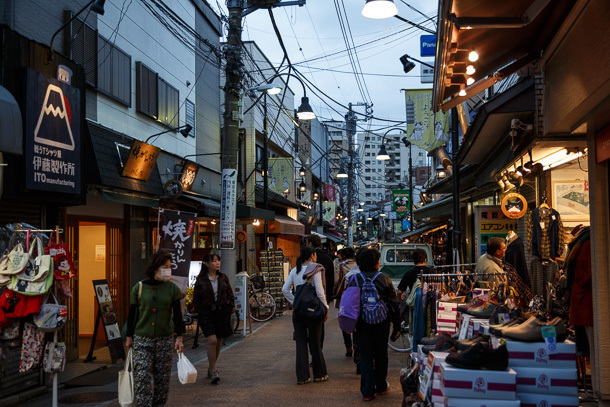 Belonging to a shōtengai gives individual owners a platform to act together in making deliberate and coordinated decisions like these. 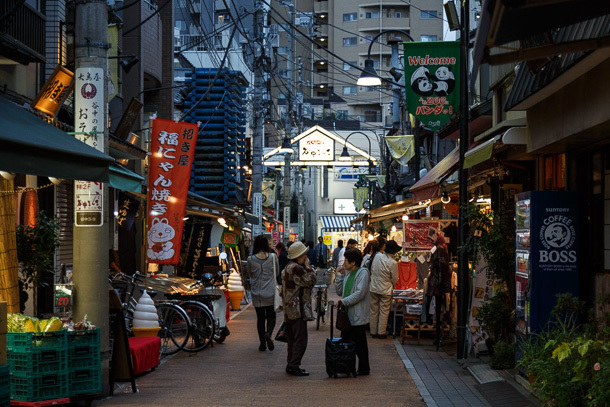 Placemaking is a term used in contemporary urbanism circles, referring to these kinds of practices, attributed to the ideas of writers like Jane Jacobs and Willam H. Whyte. 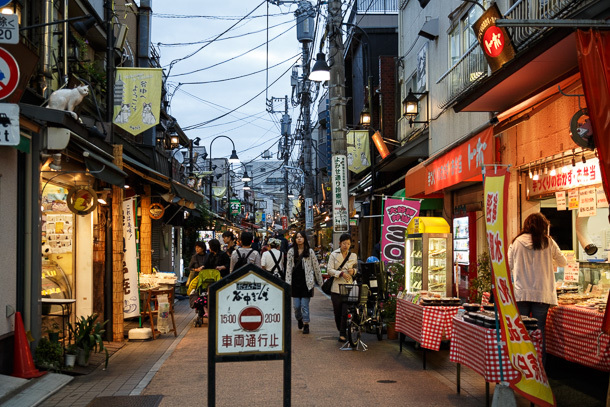 But neighborhoods in Japanese cities and shōtengai in particular were following this approach long before it entered the North American conversation, and they didn’t need a buzzword to do it. This was a Tuesday, so the crowd was light enough to see down the street and mostly comprised of locals. The blue-green sky light becomes more green after bouncing off the awnings. 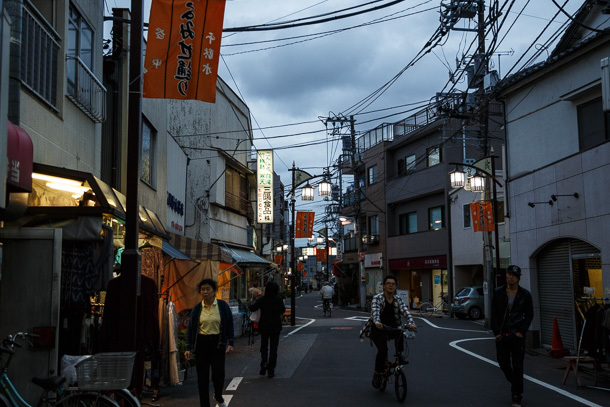 Together with the shop and street lamps, the whole scene had a soft, dreamlike color. There are no traffic sounds down in the valley. 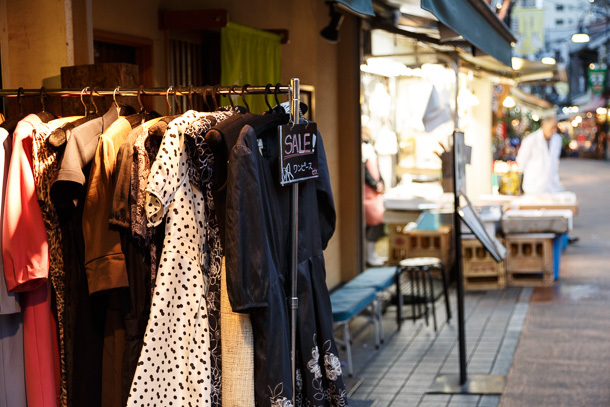 It was quiet enough to hear individual conversations as you walked along, punctuated only by calls of shop hands beckoning passersby to stop and look at the goods on offer. 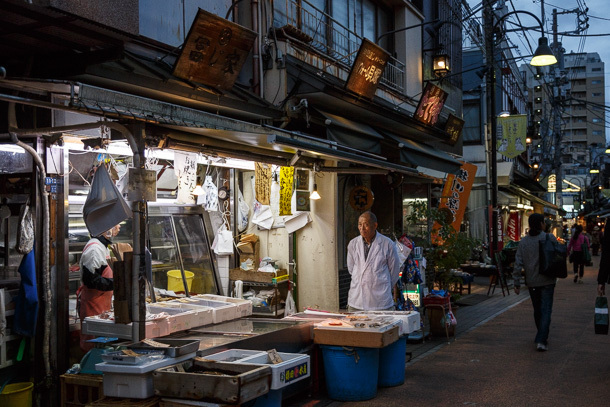 It’s rare to find a space this calm in Tokyo. It almost feels as if one is walking through a movie set. 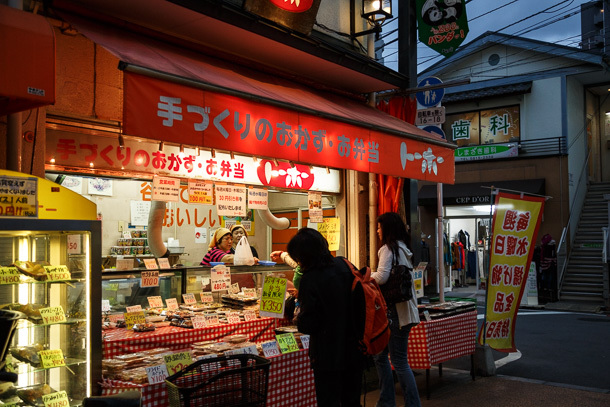 This is a butcher, though the huge yellow signs advertising croquettes and menchi-katsu tell you that they are probably targeting casual visitors just looking for a snack. Can’t get enough of this warm white lamp and blue-green sky combination. This larger grocery store was the only shop front that seemed a little out of place, though it does its best to blend in. I’ve actually noticed this quite a bit on my shōtengai walks over the past year. 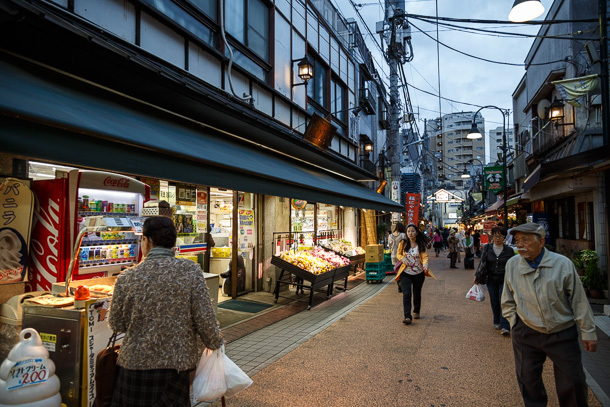 While shōtengai have typically been wary of large grocery and retail chains for fear of being unable to compete, I’ve seen modest-sized grocers move in as tenants in shopping streets big and small. 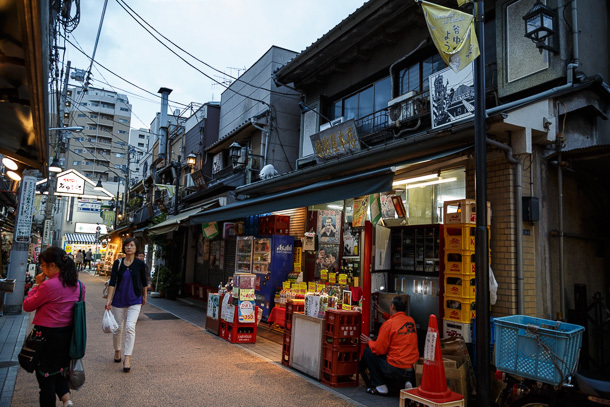 In order to position itself as a centrally located, one-stop shop for neighborhoods, perhaps shōtengai are smart to work with larger businesses as partners, rather than fight against them. If allowing the tenant mix to include a few larger grocers or pharmacies means preserving more places like this, I can’t think it’s a bad thing. 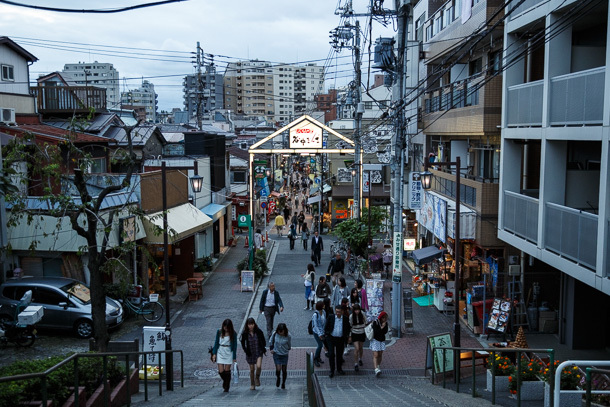 Yanaka Ginza joins another shōtengai in the T intersection at its west end. 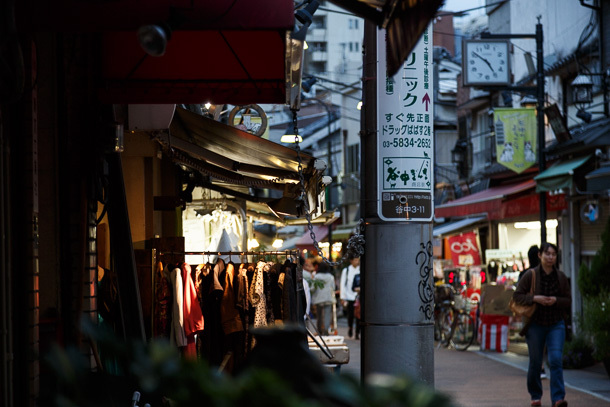 The sign indicates vehicles are not permitted from 3:00pm to 8:00pm, though as with other popular shōtengai, I would guess Yanaka Ginza remains de facto pedestrianized even outside these times. 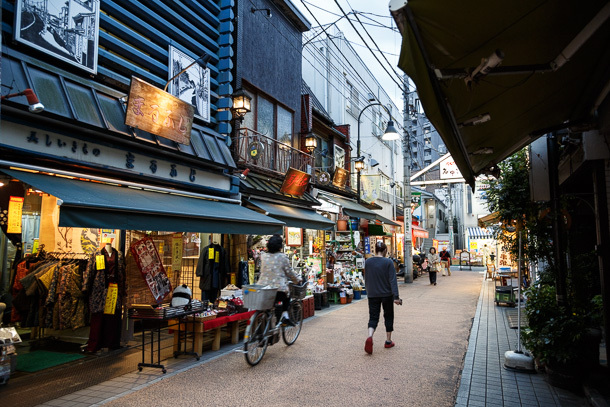 In the same way that Kyoto locals will steer clear of Nishiki Ichiba during the middle of day, and Shanghaiers turn their noses up at Xintiandi and Tianzifang, would increasing emphasis on tourism as a business driver eventually make Yanaka Ginza unattractive to the people who grew up with it? 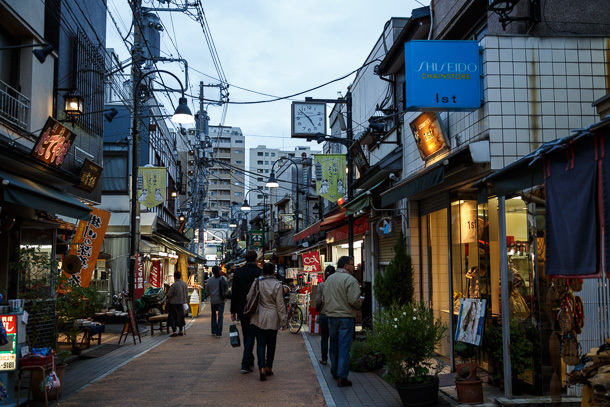 This is a question that the shōtengai promotion association probably considers often as it weighs decisions about the street and its tenants. Let’s hope they find continued success in their goal of meeting the needs of both types of customers. We don’t know what works until someone tries. 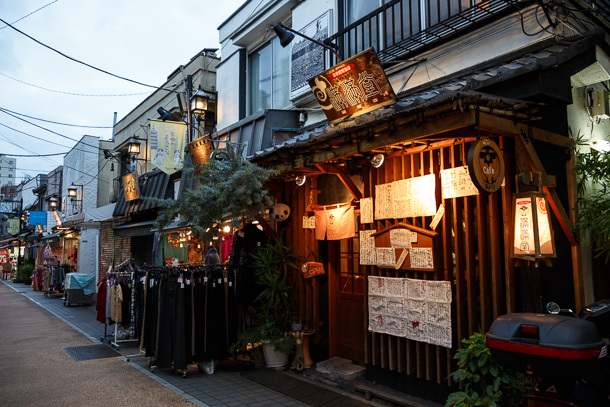 De-lurking to say I love, love, love your blog, and I’ve been waiting for you to do a post about Yanaka Ginza, which is one of my favorite places. 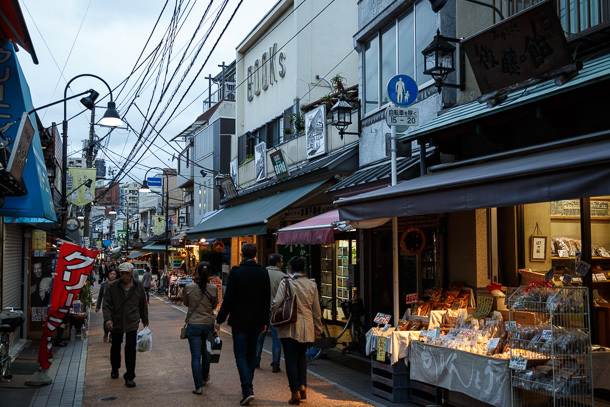 As someone who’s written about Yanaka for tourists, it’s interesting to read about their ambivalence. 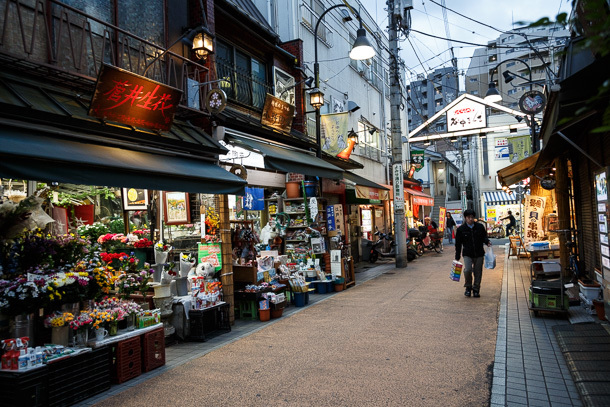 When I’ve been there, it has seemed to dominated by locals doing their shopping (although oddly, I ended up playing tour guide for people from other parts of Tokyo who knew nothing about that part of town except, like you said, recognizing Yanaka Ginza from TV). 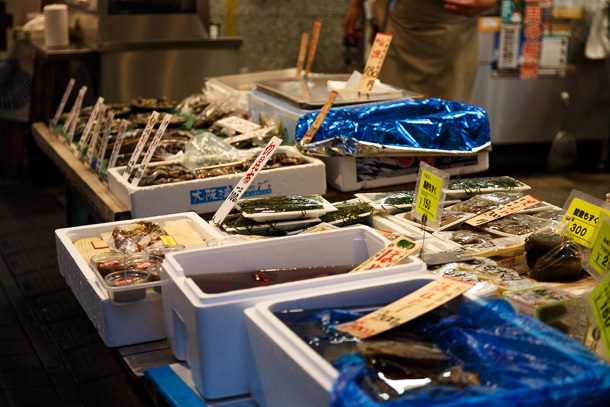 But I only had a little basis for comparison – I’m going to try to check out other shotengai that you’ve written about on my next trip. Hi Linda! Thanks for checking in ^_^ If I understand their intentions correctly, they’re really hoping they can please both the tourists and locals. 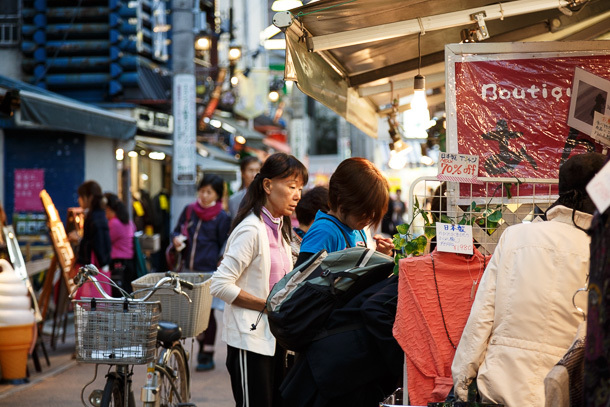 They see the value of and embrace casual visitors, but they don’t want to alienate the longtime shoppers looking for fresh food and necessities. It would be wonderful if they can do it, though like a lot of things in life, trying to be all things to all people seems like a tricky game. Get it wrong and you end up with some mediocre middle ground that nobody likes! For this visitor, the fact that there’s real life going on there, and not just tourist shops, is exactly what makes it worth visiting. I really feel like it’s basically perfect, I hope they keep it up. By the way, my only Tokyo friend who knows the neighborhood told me that butcher has the best menchi katsu in town. Me too. 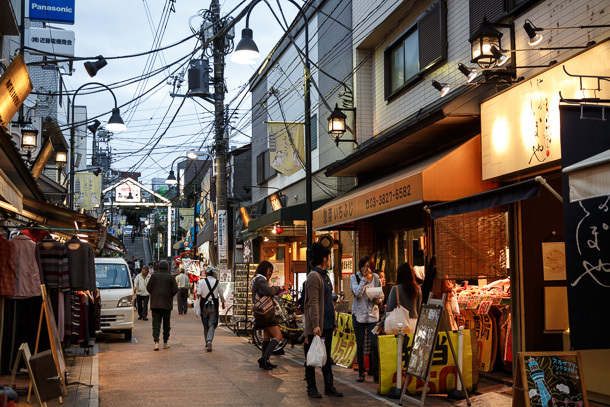 I often get lumped in with travelogue/tourism writing because that’s what most people know, but the fact that all of these neighborhoods I visit are “real” places that people live, work and shop is precisely what I try to get across. My katsu knowledge is pretty minimal relative to what I know about ramen, but they looked awfully good!